JB&D Siding and Window is a family owned business established in 1976. For over 40 years, we have provided Galesburg and Macomb top-notch customer service for all your gutter needs including the #1 gutter covers in the USA, Gutter Helmet. Our professional sales and installation services for gutter systems are offered to homeowners in the Galesburg and Macomb area and parts of Ohio. With thousands of installations under our belt, you can count on us to provide quality service, reliability and dependable products. 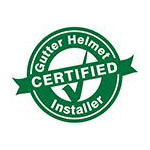 Installed by our factory-trained technicians, Gutter Helmet comes with a Triple Lifetime Warranty for material, performance and transferability. JB&D Siding and Window also offers exterior home improvements including, roofing, siding, doors and windows, sunrooms and insulation services. Members of the BBB since 1996, we have maintained an A+ Rating without a single complaint! JB&D Siding and Window has had a lot of experience with gutters and gutter protection over the years. We have found Gutter Helmet to be a high quality product and a very effective gutter protection system. Gutter Helmet’s patented nose forward design keeps out debris such as leaves, twigs, pine needles and others to give you peace of mind that you gutters are clean. Rainwater can flow freely through your gutters into the downspouts and away from your home, preventing expensive damage to roof, walls and foundation. With Gutter Helmet installed, you can forget about climbing that ladder and risking serious injury or having to pay anyone to clean your gutters ever again. JB&D Siding and Window can end your gutter cleaning days. Call us today to get a free quote on Gutter Helmet gutter covers or use our convenient online request form and we will get back to you ASAP.